It’s been quite a while since I last posted, but I can’t resist reminding you of some of the really great gluten free, dairy free, and paleo recipes on this site for Thanksgiving. So moist and delicious no-one suspects it’s anything other than “the real thing”! Expect to hear “more pie, please” when you serve this un-traditional, traditional Thanksgiving favorite. I love to have it with Coconut Bliss Coconut Ice cream. Smooth as silk, this holiday soup is a great way to start the meal. 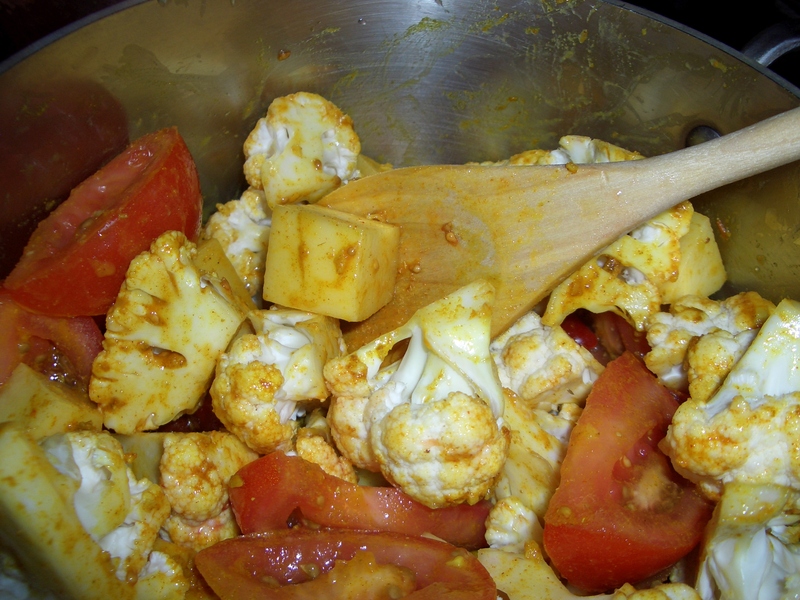 This is an unusual salad everyone will love and ask for the recipe. For those of you who are looking for a lighter dessert or a yummy sweet side dish, these are just the ticket. 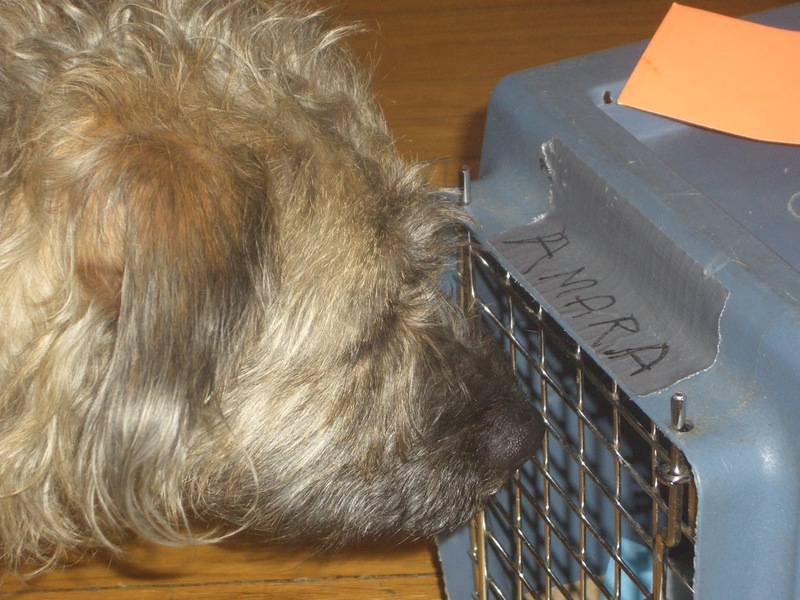 Ironically, my dog Bella is on a Paleo diet. No, it’s not because I’m some paleo fanatic, but because she has itch issues and the vet has taken her off the most common allergens: beef, chicken, and grains. I buy her grain-free kibble but then to make it more appealing, I make ground lamb stew to stir into it. About once a month I traipse to the the meat market that has reasonably priced ground lamb and buy about 5 pounds, then portion it out for single meals. This month I bought way too much lamb. As it happens, I had made the Paleo Olive Oil Mashed Potatoes the day before – so Shepherd’s Pie was a no-brainer for the extra ground lamb. Paleo-izing the Shepherd’s Pie was an interesting challenge. The potato topping I had already dealt with in last week’s post. The filling traditionally uses flour (wheat, of course) to create a thick gravy. 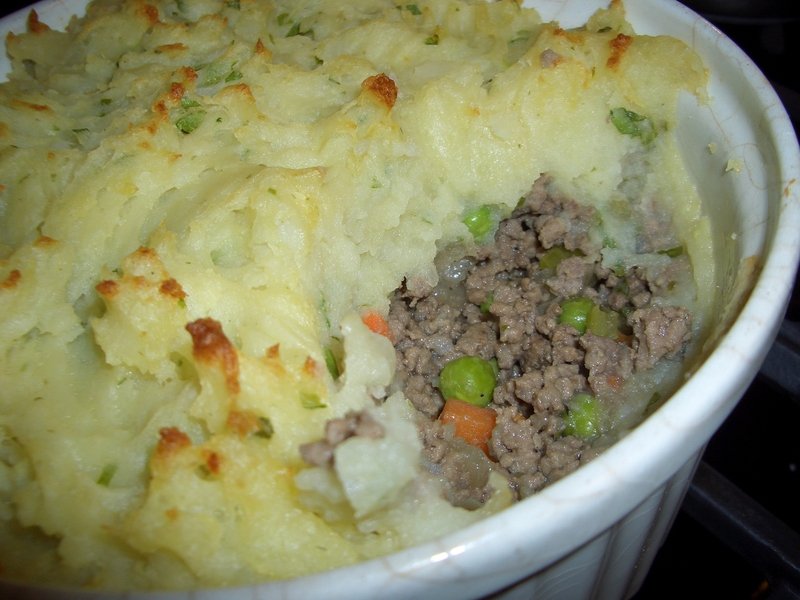 My thinking was, instead of substituting an alternate flour for the wheat, why not just let the potatoes be the gravy as well as the topping – after all, I love to smoosh the potatoes into the meat part when I eat Shepherd’s Pie anyway. The result is a tasty, but less thick meat stew. 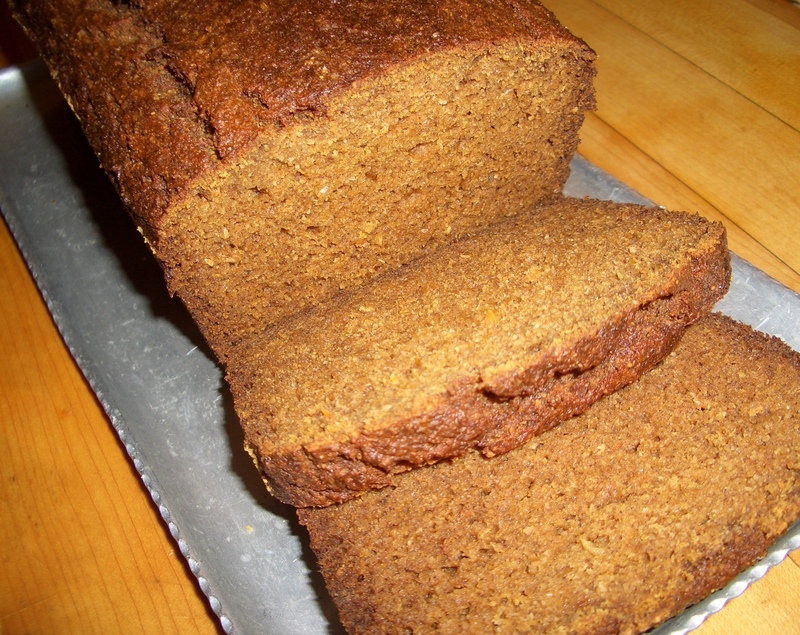 I liked it very much as I sometimes find traditional recipes to be a little pasty. About the vegetables…I confess I use frozen vegetables. They’re easy and, frankly, I like them. If you are more ambitious than I, feel free to start with fresh vegetables and cook them before adding them to the meat or just throw in any leftover vegetables you have from previous meals. It doesn’t really matter what vegetables you use, or even how much you throw in – Shepherd’s Pie is very forgiving. Though I used ground lamb for the reason stated above, I also love ground lamb; but I know there are many non-lamb eaters in the world you if you are one of them, ground beef or even ground bison would be perfectly fine substitutes. This is a great winter meal with protein, starch, and vegetables all in one dish – add a salad for crunch and you are good to go. I’m going to my cousin’s house for Thanksgiving dinner this year. 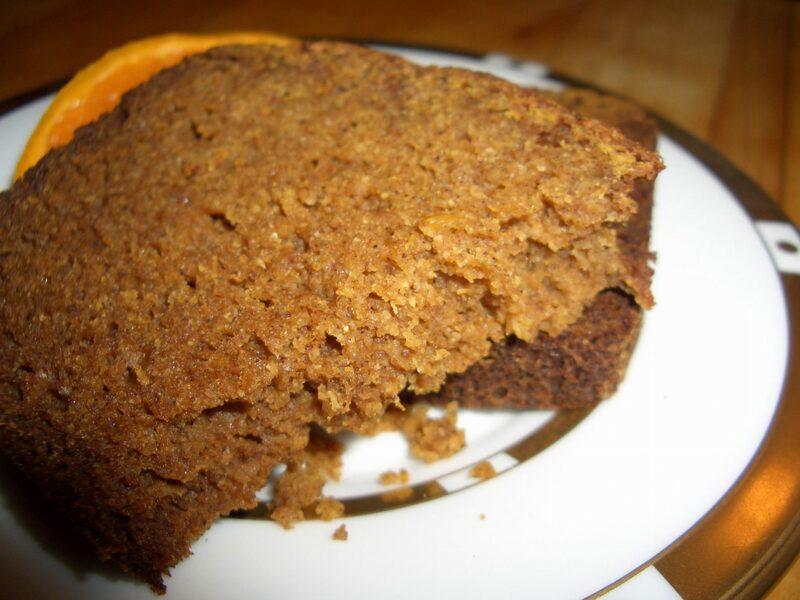 In self defense I offered to bring the pumpkin bread so that it would be Paleo. I have to confess/brag that I don’t think anyone there will even know that it is anything other than a regular pumpkin bread. So, as happens all too frequently, I just couldn’t resist a bargain bunch of asparagus – even though I had no particular use for them. I brought them home, put them in the refrigerator (I didn’t put them into a green bag that would have extended the life until I really wanted to use them) and 3 days later they are looking sad. Soup, of course is the great burial ground of dying vegetables – so I took all the sad things I had in the fridge – 1 pathetic leek, 1 mangy stalk of lemon grass, and the drooping asparagus. Sounds appetizing, yes?? Unbelievably this is now one of my new favorite soups! In my first recipe test I had red pepper flakes but it made it pretty spicy so I eliminated them from the recipe – you may want to include some if you like your soup spicy. 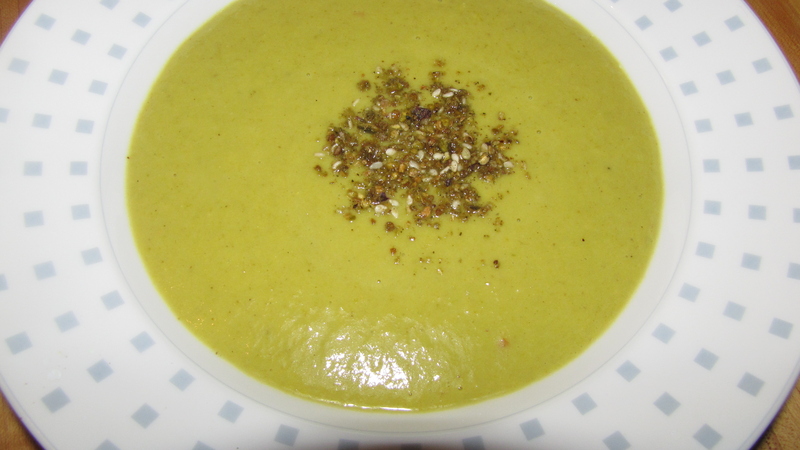 If you can eat dairy – this soup would be yummy garnished with yogurt. I think I started to change my opinion at Carmine’s, a family style restaurant. Someone ordered fried calamari for the table and insisted I try one. OMG! Who knew how delicious, tender, and non-rubber bandy they could be. I couldn’t stop eating them…and now I dream of them. But that was fried calamari…let’s be honest if you fried fishy rubber bands and gave me a delicious dipping sauce for them , I might fall in love with them too. The transition to non-fried calamari came in a seafood cooking class. One of the dishes was a squid salad and one of my tasks was cleaning the squid (which I was awesome at) and after doing all that work, I had to try the dish. Okay, not love a first bite – but pretty good. Fast forward to last week and I’m at the farmer’s market where the fish monger has fresh squid and some weird impulse seduced me to buy some. I think it was more to see if I remembered how to clean them (the class was several years ago) then to actually eat them. But here I am, a bunch of perfectly cleaned calamari and wondering what to do with them. This recipe was my answer…and an excellent answer it was! BTW if you want a really speedy version of this recipe, just heat up your favorite spaghetti sauce and stir in some calamari slices and cook a minute or two until opaque. 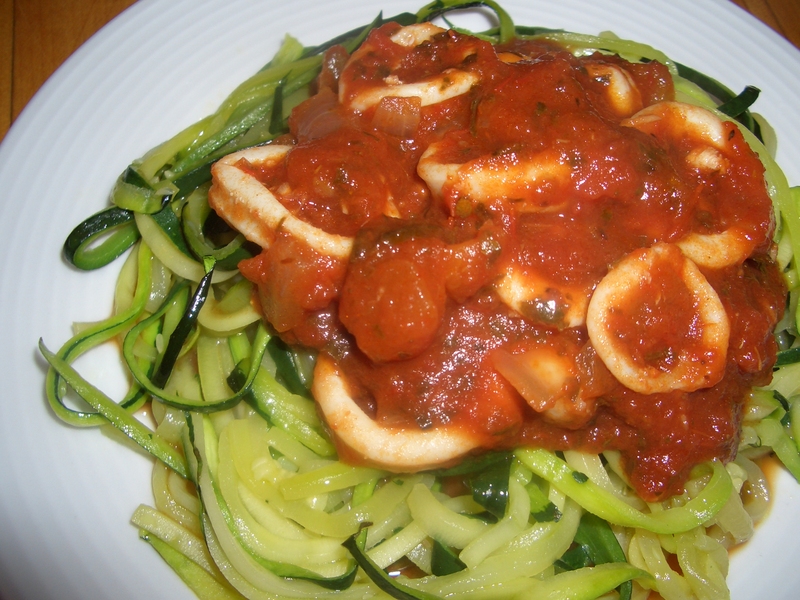 Of course I serve mine with zuchetti, if you are not paleo or gluten free, you can use any kind of pasta. This has always been my favorite dish to order when I’m having a meal at an Indian restaurant (or when I’m ordering in from one). It’s probably one of the only savory dishes I make that doesn’t contain either onion or garlic – which means I can serve it to my friend who is allergic to both. 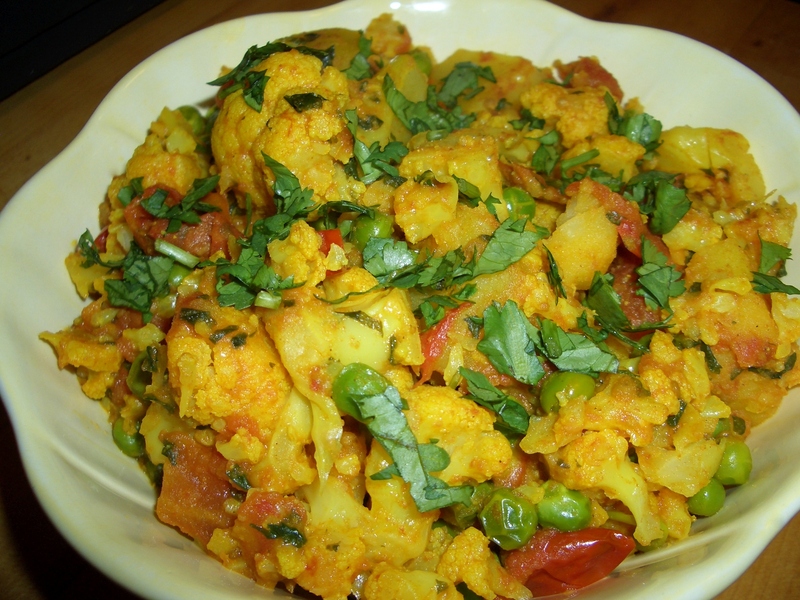 Usually you find Aloo Gobi (cauliflower and potatoes) on restaurant menus but I like the texture and color that the peas (matar) contribute to the dish. Though I like the peas, if you are strictly paleo you may want to leave them out. When cooking this, it’s hard to tell how juicy your tomatoes are going to become, so you may or may not need additional water. Using boiling potatoes will ensure that your potato cubes remain pretty intact. 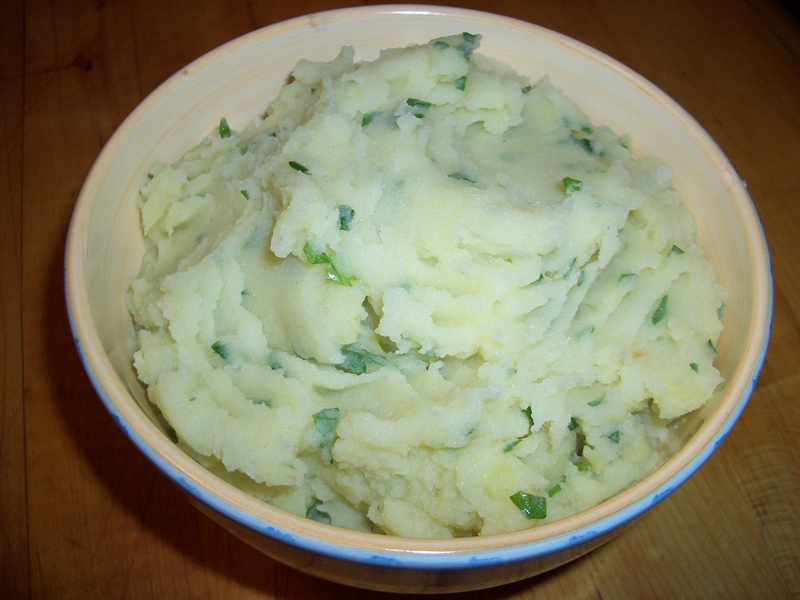 You don’t want mashed potatoes; you want the dish to be just a little saucy. Stir this dish occasionally as it cooks to make sure the liquid doesn’t evaporate completely. In a 3-quart pot, heat the oil over medium high heat. 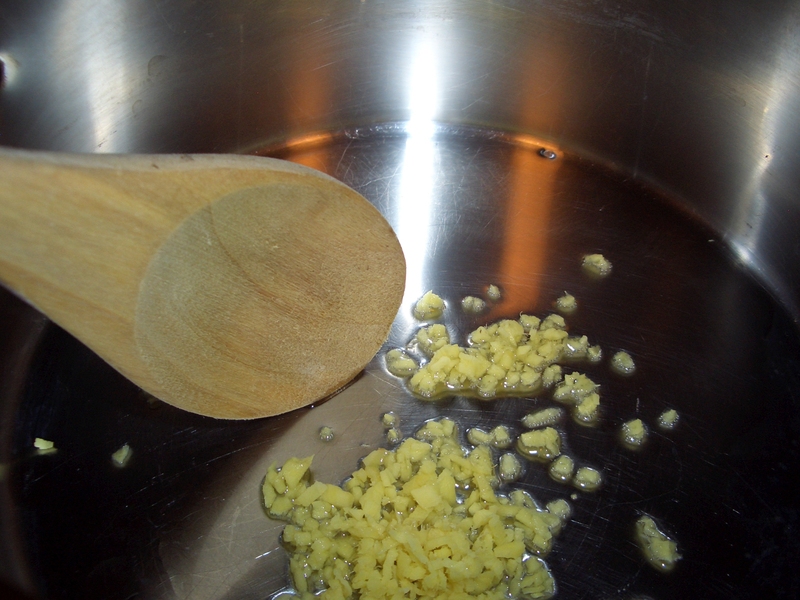 Add the ginger and cook, stirring 30 seconds. 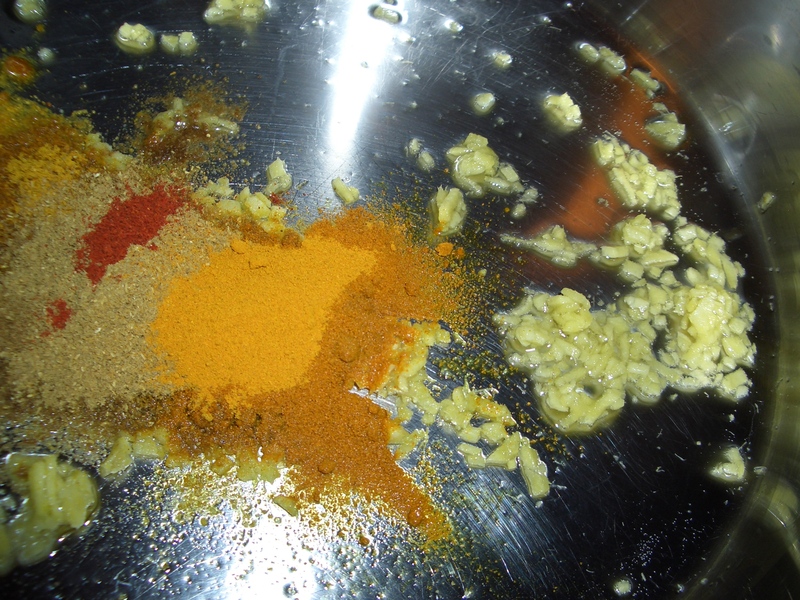 Add the curry, coriander, turmeric, cumin, and ground red pepper; stir until absorbed. 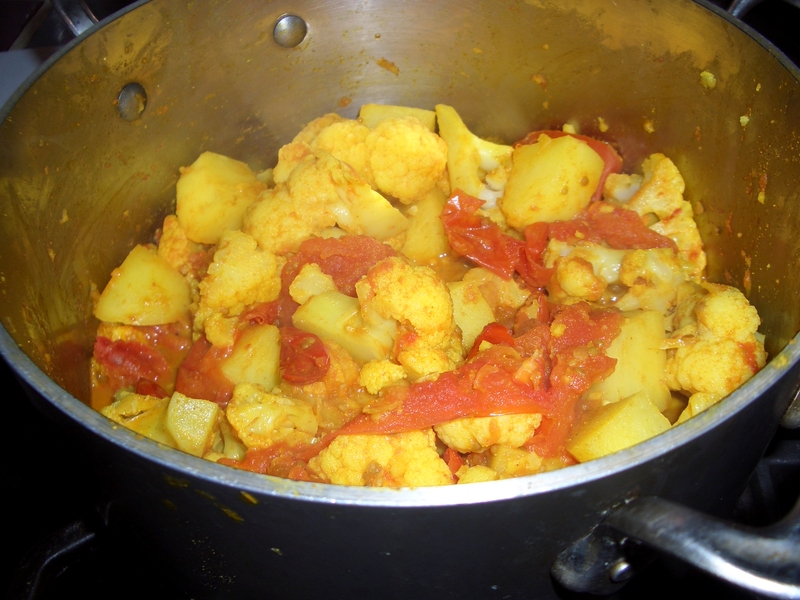 Stir in the 2 tablespoons water; add the cauliflower, potato, and tomatoes. 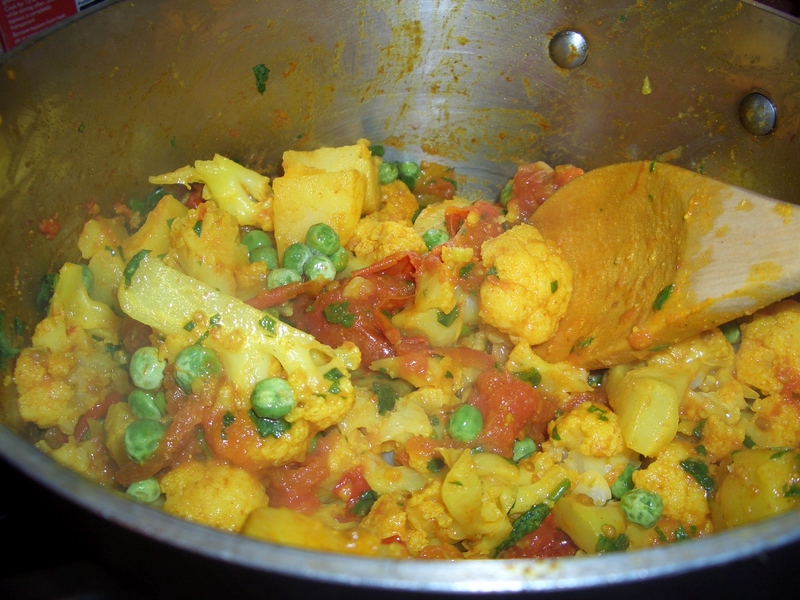 Stir until vegetables are coated with spice mixture. Cook, covered, over medium heat 5 minutes until mixture starts to steam. 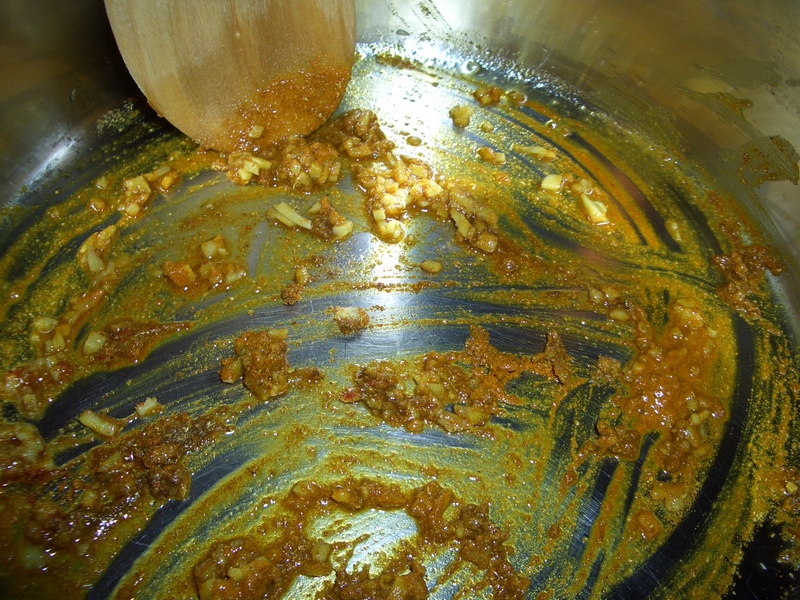 Stir; reduce heat and cook, covered 10 minutes longer. Stir and see if any additional water is needed (adding 1 to 2 tablespoons as necessary). Continue cooking 10 minutes, covered or until potatoes are cooked through. Add peas and cilantro, adding water if necessary. Cover and continue to cook 5 minutes longer. Season with salt to taste. Spoon into serving dish and sprinkle with chopped cilantro if desired. 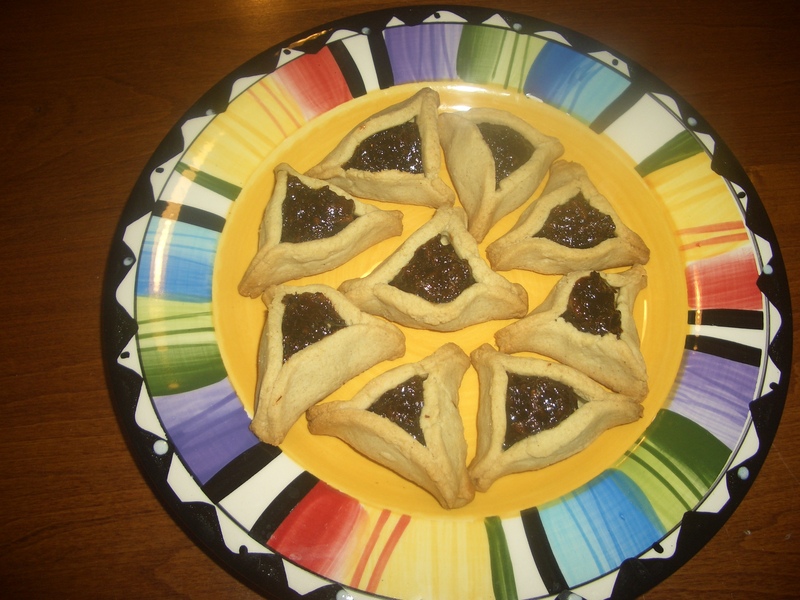 This recipe is a paleo update of a post I made about for Passover 2 years ago. 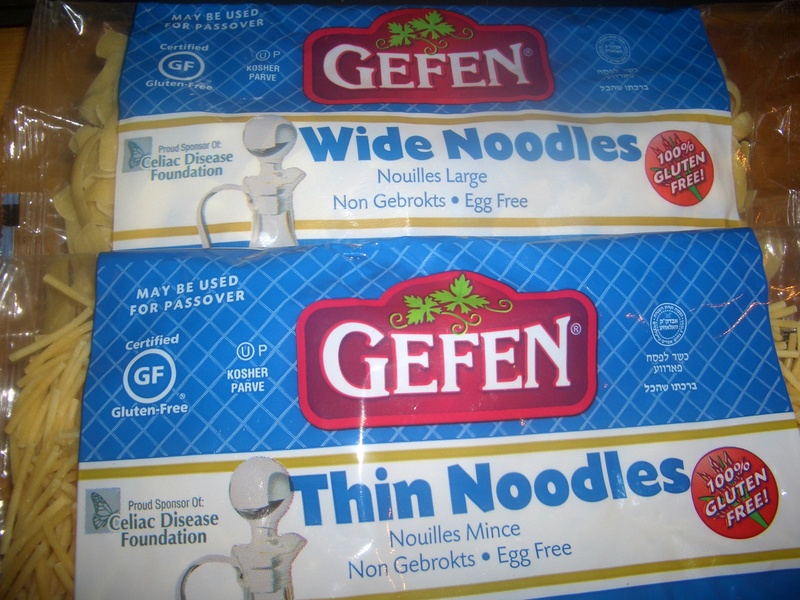 But you don’t have to limit it to Pesach, it’s just as delicious for Rosh Hashanna or break fast. In the olden days I used to make a spectacular noodle pudding with sour cream and cottage cheese and pineapple (although the pineapple had to be omitted a long long time ago when I became violently allergic to it). 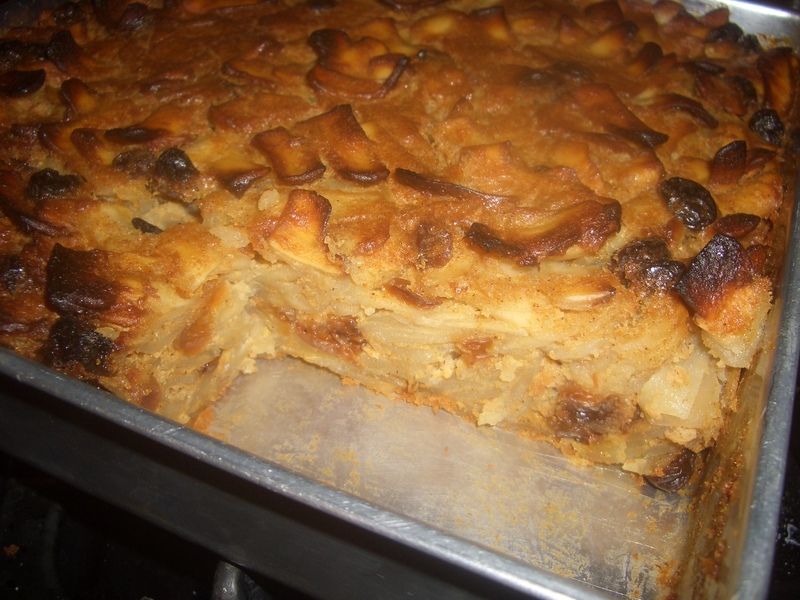 So, I was a little worried about how a non-dairy, gluten free kugel would come out. The answer is GOOD – really good. I suspect my family will miss my matzoh kugel this year, but honestly the gluten free matzoh – even though it tastes quite good – just disintegrates and turns to mush when I tried to make the kugel. So I hope they will forgive me or even better learn to love this noodle pudding instead. Oh yes, it freezes (which is why I could make it today and plan to serve it at seder) well; just reheat before serving. Breakfast is my favorite meal. I’m happy having breakfast for lunch or dinner or a snack. 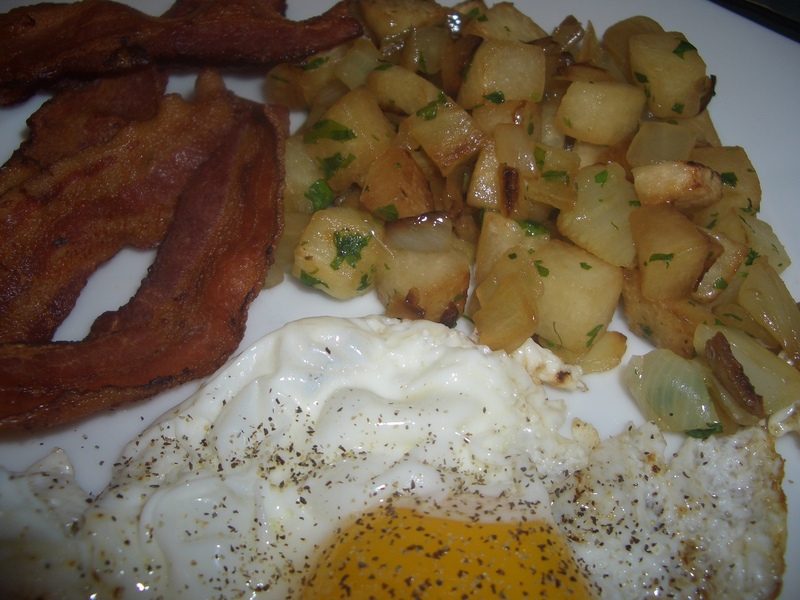 That being said, you would think I have no objection to everyday home fries…and in fact I don’t, but I was wondering what someone who doesn’t eat white potatoes could do to substitute for home fries. My answer is jicama and fennel. YUM! A good choice even if you do eat white potatoes.